The updated version of Duplicate Remover will remove duplicate and junk items correctly even with the latest Windows October Update. This is a routine update dedicated to make sure product runs stable and without issues on latest environment, therefore includes latest versions of components. Several cosmetic and low priority issues were fixed as well. With this update we address couple issues with the Duplicate Killer Trial limitations not working correctly, as well as couple of other bug fixes. Latest Redemption version included into this upgrade to make sure better performance and stability with latest Outlook versions. Many User Interface issues were fixed that occurred when user would set the PC DPI setting to more than 100%. This update includes important bug fix for our international customers – only ASCII symbols or current system locale symbols were considered when searching for duplicate items or displaying them. Now all Unicode symbols are compared and shown correctly. When searching for duplicates or displaying items software was not working as supposed to - if item contained information in Unicode – the corresponding symbol from ASCII was taken instead. This issue affected both searching for duplicates and displaying such items in the user interface. Several important issues were fixed in this update: crashes with Skype for Business Contacts, freeze when relatively many items are being searched / processed. 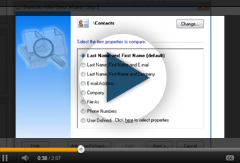 Duplicate Killer would crash when merging Skype for Business or Global Address Book Contacts. Duplicate Killer would freeze when searching / processing relatively many contacts (usually more than several thousands, but all depending on computer RAM accessible at he moment). Disabled “Deactivate” button, which did not work and should not be working. Couple of other minor issues.